One of my biggest hobbies, okay, actually, my biggest hobby, is blogging. Because I don’t really know very many bloggers in my real face-to-face life and because I enjoy talking blogging I thought for the next while I would blog about blogging. It’s like writers who write about writing, though somehow weirder. Or maybe it’s just me that’s weird, that’s probably it. I started blogging (in a different form, on a different platform) in the fall of 2004. 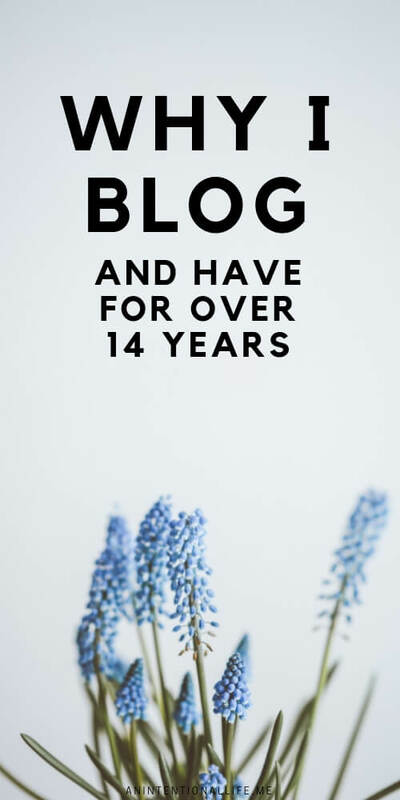 That means it’s been 14.5 years since I started blogging. Wow. To start this blogging series I want to share a little about why I actually blog and why I think you should too. This list is not actually in order of importance but this is one that a lot of people are curious about so why not start here. Yes, blogging actually does make me some money, as someone who has been a chronic entrepreneur for her whole life, that’s a fun accomplishment. Part two of this blogging series (and maybe three, four and five) are going to cover more details on the money aspect, stay tuned if you are at all curious about blogging or making money online. This is actually my number one reason I blog. I blogged for years online without making any money, even if I stopped making money I would continue to write. As a teenager my writing was a traditional notebook and pen, journal writing, as an adult I chose to write in blog form. Being able to connect with others is a huge plus to writing online. If absolutely no one ever read what I wrote I would probably go back to my notebook and pen, still writing, just in old school form. I have made some great connections thanks to my various blogs over the years and that has been really fun. I run a few different blogs/sites and one of my favorite things to do is to share great resources I have found with my followers. I view myself a bit as a content curator of my various niches on the internet. I like to sift through all the resources and toss aside the not-so-great and share the great. For a number of years I blogged about adoption, orphan care and a variety of social justice issues. I loved being able to raise awareness of these issues and also inspiring others to help make a difference. While there are other reasons I blog, those are the major ones. I know some people that want to blog but don’t think they have anything to write about. If you are stuck for ideas I always suggest just starting by writing about whatever is going on in your life. From there you may continue to blog that way or you may find one area that you prefer to write about. If you are looking for a cheap hobby you really can’t beat blogging. You can do it for free or you can pay a little bit for a nicer site (my preference) but even then, it’s not much and it is still cheaper than 99% of the hobbies out there. Unless maybe if your hobby is dumpster diving or something else completely free (though, I would argue that the potential health hazards from dumpster diving may make it not so free. 😬). Sharing a portion of your life can also be very therapeutic, and like I already mentioned, blogging is cheap, it’s much cheaper than actual therapy . . .
You were wondering when I would get to this one, weren’t you? 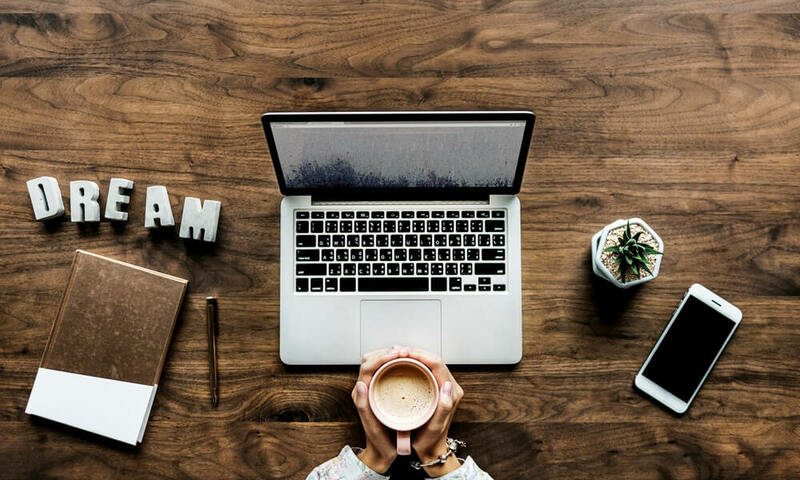 Whether you make physical products to sell, digital products or just want to make money by your writing, there are so many different ways blogging can bring in an income. Like I mentioned earlier, the next few posts in this series will probably be on this topic. If you are interested in learning more, I would love for you to leave a comment or send me an email (chantel@anintentionallife.me) and let me know more about the blog you would like to start and that may influence the order of the next few posts. 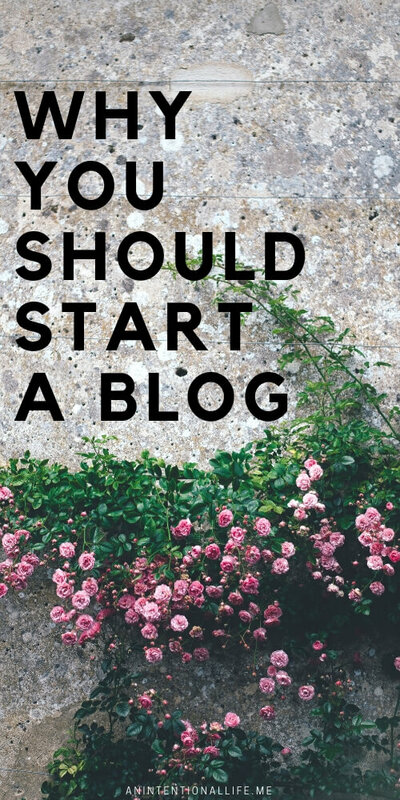 I have had so many people over the years that they want to start a blog but they usually have some reason why they haven’t begun. So, if you want to start a blog, I’d love to challenge you to make your first steps today! I’ve started a few blogs in my day so I’ve had a bit of practice but I can usually have a new blog live within 24 hours of deciding to go for it. I’m not saying you need to have something up in the next day, I’m just saying that it’s not hard. 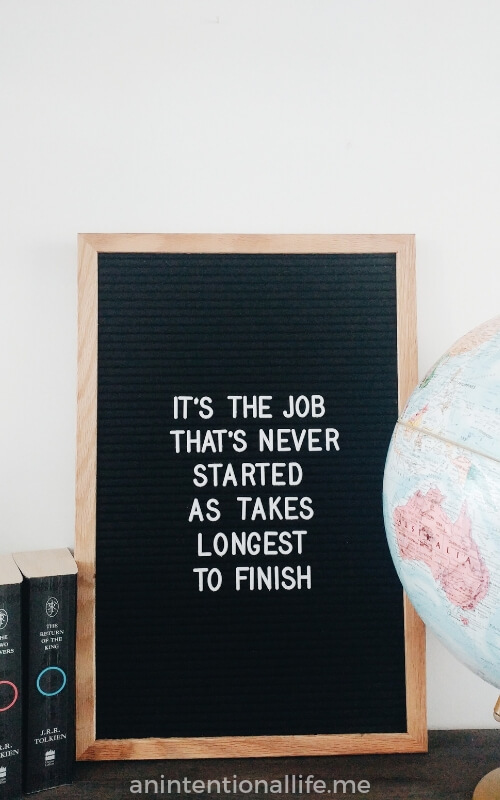 You can take a little more than 24 hours to get started but there is no reason for it to take a long time. 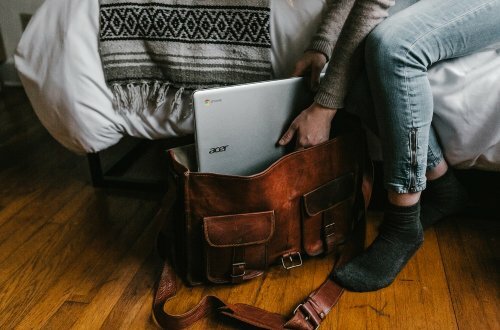 Need help starting your blog? I wrote a How to Start a Blog post two years ago that can help you out! Thanks for sticking with me in my first post in this blogging series. If you want to chat blogging feel free to leave a comment or send me an email, I’d love to chat about it!